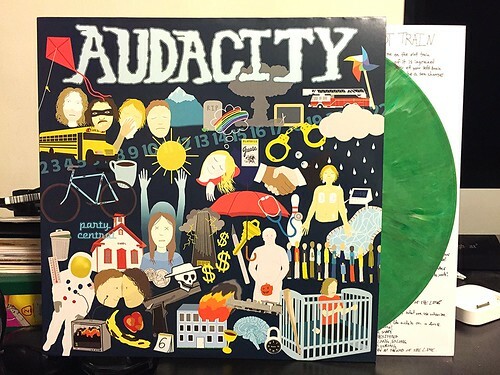 Audacity's last album from 2013, Butter Knife, was one of those perfect storm records for me. I had dug the band's prior album, but was totally blown away by Butter Knife and it was easily one of my favorite records of that year. Fast forward through an excruciating three year wait and Audacity finally delivers the follow up, Hyper Vessels. In some ways, this record is a bit of a disappointment for me. I was hoping for more breezy pop perfection like the band was showing on Butter Knife. Instead, this is much more similar to Audacity's 2012 album, Mellow Cruisers. It's heavier on the garage sneer than it is on the big hooks. That's certainly not to say there aren't catchy songs on this album. Opening track "Counting The Days" will immediately dispel that notion, but in general things are a little faster and the vocals are a little snottier. If anything, this kind of sounds like it would have been the perfect follow up to Mellow Cruisers. If Hyper Vessels had been released right after Mellow Cruisers and then Butter Knife came after, it would seem like a logical progression. Instead, Audacity feels like they're taking a slight step backwards. Again, not that this isn't a good record, in fact it's a really good record, I'm just a little surprised with the direction Audacity took.